Add your unique wedding personalization to For Your Party’s custom clear wedding plastic shot glasses! Add personalized wedding shot glasses to your wedding bar, or use them as a creative tasting glass for passed appetizers. Find your perfect customized wedding shot glass design using the FYP Customizer. 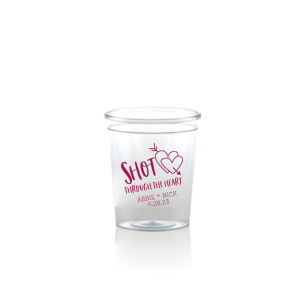 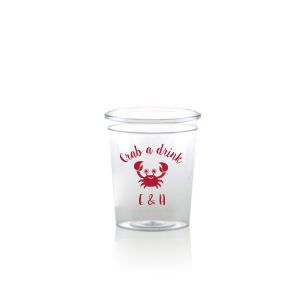 Give your wedding bar an extra boost of personalization with custom plastic wedding shot glasses! These 2 ounce shot glasses for weddings will for sure step up the festivities. 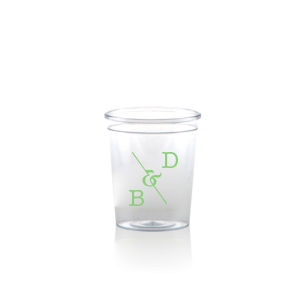 Browse our designer-made styles that you can easily personalize for a top-notch wedding shot glass. 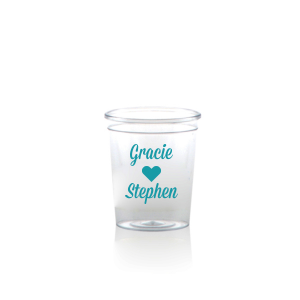 You can also start from scratch with our library of fonts and graphics on the FYP Customizer or upload your own design to create your own wedding shot glass. Get creative with your serving dishes, and use your personalized clear plastic wedding shot glasses for nuts, mints and candy to give your guests a much needed way to contain those tiny food items, passed appetizers and mini desserts. You’ll be surprised to find how many ways your custom clear plastic wedding shot glasses can be used on your wedding day!